Disclaimer: The information on this page is intended for individuals who have been medically diagnosed with Achilles tendonitis. If you suspect that you have Achilles tendonitis then it is important to visit a qualified medical professional in order to rule out any other possible causes prior to considering any advice or treatment option. If you answered yes and to any one or more of the above then the OSMO Patch may be the most important decision that you will make towards relieving your Achilles tendon pain and regaining control of your health TODAY! The OSMO Patch used together with proper rest is capable of naturally reducing swelling and pain associated with Achilles tendonitis; however let’s begin by first getting a better understanding of a few important questions such as; what is Achilles tendonitis, what causes Achilles tendonitis, what are the signs and symptoms of Achilles tendonitis and treatments for Achilles tendonitis. Overuse of the Achilles tendon (also known as the calcaneal tendon) is actually quite common and will usually lead to inflammation, swelling and Achilles tendon pain at the back of the heel. Achilles tendonitis is the name given to this condition and results from the irritation and inflammation of the large Achilles tendon in the back of the ankle. Achilles tendonitis can sometimes be confused with another common but more severe injury of the Achilles tendon known as Achilles tendinosis. While Achilles tendonitis refers only to the inflammation and swelling of the Achilles tendon, Achilles tendinosis is actually a result of degenerative, microscopic tears within the tendon. Increase in running activity, this could include the distance, speed or intensity. Not allowing enough recovery time between different activities. Often a change of footwear can be a cause of Achilles tendonitis. Weak or tight calf muscles. Regular activities which requires the Achilles tendon to stretch more than normal such as running up a hill. Overpronation or rolling in the feet when running. Overpronation is the term given to the observation of feet that roll inwards excessively. While overpronation is extremely common it often is the cause of Achilles tendonitis. Overpronation results in the lower leg being forced to rotate internally, placing a shearing force on the calf muscles. Additionally, women that regularly wear high heels are also susceptible to developing Achilles tendon pain due to Achilles tendonitis. Overtime wearing high heels can shorten the tendon and calf muscles. The Achilles tendon can then undergo stress when jogging or walking for long periods in flat shoes. This occurs due to the Achilles tendon now stretching beyond its normal range. What are the signs & symptoms of Achilles tendonitis? Pain when placing weight on the heel. Usually imagery including X-Ray and MRI may be used when diagnosing Achilles tendonitis. Within the first 24-48 hrs of noticing Achilles tendon pain it is normally helpful to rest and ice the heel and ankle. The reason for this is to try and reduce the degree of swelling and inflammation in the Achilles tendon. Achilles tendinitis is normally quite painful and disruptive. Hence along with analgesics for pain control your doctor will normally recommend that treatment from Achilles tendonitis includes anti-inflammatory medications or in severe cases he/she may even suggest a cortisone injection. Having already tried anti-inflammatory drugs and steroid injections with little to no benefit. Anti-inflammatory drugs and steroid injections might not be suitable due to age or a pre-existing medical condition. Regardless of which method is chosen Achilles tendonitis treatment is best supported together with a strategy to protect & steadily build-up the strength of the Achilles tendon. 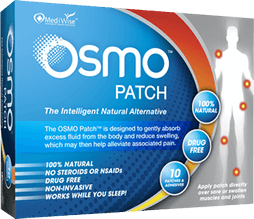 The OSMO Patch now provides an Intelligent 100% Natural solution! The OSMO Patch is able to draw fluid from the body and reduce the swelling and associated pain in conditions such as Achilles tendonitis. In fact the OMSO Patch when used properly in combination with sufficient rest is the ideal choice to support the full recovery from Achilles tendon pain. Simply apply the OSMO Patch directly over the area of pain just before going to bed; the OSMO Patch then goes to work removing fluid and stimulating blood flow continuously through the night while you sleep. When you wake up just remove the used patch and then simply discard. So if you are ready for a natural & effective approach to relieving inflammation and pain caused by Achilles tendonitis then the OSMO Patch is the Answer!